The grey tree pincushion is endemic to the Cape Peninsula where it is a conspicuous feature of the northern and western mountainsides. It makes a decorative garden shrub, often with an interesting bent shape, and it provides an unusual colour combination of greyish foliage and bright, golden yellow flowers. Descriptions from early travellers tell us that it was once abundant in the area now covered by Cape Town. It occurs mainly in the richer, heavy clay soils derived from Cape Granite and shales but also occurs in sandy soils derived from Table Mountain Sandstone in some places. Its habitat is very windy, cool and wet in winter and hot and dry in summer. Leucospermum conocarpodendron subsp. conocarpodendron is a tree-like shrub, 3-5 m tall and 3-6 m in diameter, with a dense, rounded habit and often with a gnarled and bent shape. It has a single, stout main stem, 150-400 mm in diameter, covered with 30-50 mm thick bark. Flowering stems are stout and rigid and are covered with a shaggy layer of fine, silky hairs. Leaves are stalkless (sessile) and have a rounded apex with 3-10 teeth. The leaves are grey-green and covered in a dense layer of fine, short, curly hairs, which require a magnifying lens to be seen properly, and which can be rubbed off. The leaves lose this covering and become hairless after several years (glabrescent). The flower heads are spherical to egg-shaped, 70-90 mm in diameter and a showy, bright golden yellow. They are usually borne in groups of up to three, occasionally singly. The flower head is partly enclosed by the uppermost leaves on the stem. Flowering occurs in late winter until midsummer (August to December). Large, nut-like seeds fall from the flower heads about two months after flowering. Leucospermum conocarpodendron subsp. conocarpodendron is relatively slow growing, yet produces its first flowers in its third year. There are two subspecies of Leucospermum conocarpodendron: subsp. conocarpodendron and subsp. viridum, the green tree pincushion. The subsp. viridum can be identified by its deep green leaves that are hairless or ageing hairless-they may have a few scattered straight hairs or the margins fringed with long silky hairs but its leaves never have a dense mat of grey hairs. Their distribution ranges don't overlap, subsp. viridum occurs along the eastern slopes of the Cape Peninsula from Newlands and Kirstenbosch to the southern Peninsula, as well as in the Kogelberg, Franschoek, Houwhoek and Stanford. There is a naturally occurring hybrid population on the slopes of Little Lion's Head where the two subspecies almost meet up. Leucospermum conocarpodendron subsp. 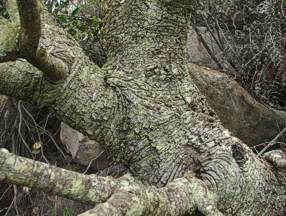 conocarpodendron is locally abundant and part of its range is well conserved within the Table Mountain National Park, but this subspecies is classified as Vulnerable on the Interim Red Data List (October 2007) because it has lost a significant portion of its distribution range to urbanization, gum plantations and invasive alien plants. More housing developments are planned, which will remove even more of its remaining habitat. Invasive alien ants have also disrupted the seed bank. Furthermore, suppression of fires inside its range is allowing fynbos to transform into thicket which further reduces the area suitable to its growth requirements, and when fires do occur they are hotter due to the increased amount of fuel and therefore kill a larger proportion of the plants. Additionally, home owners living inside the natural distribution range have planted the subsp. viridum in their gardens, which is known to hybridize with subsp. conocarpodendron. This species is bird pollinated and the wild plants are easily within range of the cultivated plants. Cross pollination will contaminate the gene pool and the subspecies could be permanently changed and even wiped out. Home owners inside the distribution range are advised not to grow the subsp. viridum and should remove any plants from their gardens. Leucospermum conocarpodendron subsp. conocarpodendron is endemic to the Cape Peninsula, where it grows on well-drained, north- or west-facing rocky slopes, from sea level to 160 m, over a limited area from the eastern slopes of Devil's Peak, along the northern and western slopes of Table Mountain and the Twelve Apostles to Llandudno. The genus Leucospermum is named from the Greek, leukos, meaning white, and sperma, seed, referring to the white or light-coloured seeds of many species. The species name conocarpodendron is a combination of three Greek words: konos, a cone; karpos, a fruit; and dendron, meaning cone-fruited tree or tree with fruits in a cone. The first published description of a Leucospermum was in Paul Hermann's Paradisi Batavi Prodromus in 1689. 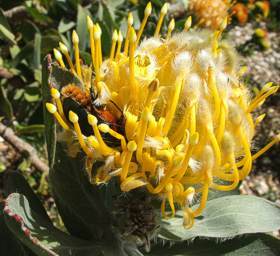 The species described is Leucospermum conocarpodendron, which Hermann saw growing on the lower slopes of Table Mountain when he visited the Cape in 1672, but in his description he called it Salix conophora Africana, which means cone-bearing willow tree from Africa. Linnaeus described and named this species Leucadendron conocarpodendron in 1753. Reichard called it Protea conocarpodendron in 1779. Thunberg called it Protea conocarpa in 1781. Richard Brown revised the protea family and placed it in the genus Leucospermum, calling it Leucospermum conocarpum in 1810. H. Buek kept it in the genus but conserved Linnaeus species name and renamed it Leucospermum conocarpodendron in 1874. John Rourke divided it into the two subspecies in his monograph on the genus in 1972. The common name kreupelhout has been in use since about 1680. The hout part means wood and is from the Dutch term used to refer to shrubby brushwood used as firewood. The kreupel part means lame or crippled and refers to the bent and gnarled shape of some of the plants and the way the growth of the branches often show abrupt, nearly 90° bends. Vaal is the qualifying prefix for this subspecies as it means grey and refers to its grey leaves. This species has earned a few more common names over the years, but they are no longer in use, e.g. goudsboom or goueboom, meaning golden tree, referring to the golden yellow flower heads; brandhoutboom, meaning firewood tree, referring to the days when it was an important source of firewood in the Cape; and bobbejaanbos, meaning baboon's bush, referring to the behaviour of baboons that were seen tearing off the flower heads and chewing them. This species was introduced into cultivation in Holland in about 1700 and was being illustrated from specimens grown there by 1710. Masson introduced the species to cultivation in England in 1774. The genus Leucospermum is a member of the protea family. It consists of 48 species that occur in southern Africa as far north as Zimbabwe, with the majority occurring in the winter rainfall regions of Western Cape. The brightly coloured and unscented flower heads of Leucospermum conocarpodendron subsp. conocarpodendron are pollinated by birds, sugarbirds and sunbirds being the main pollinators. They perch on the flower heads or the stems and probe into the flower head in search of nectar, and in so doing, their heads and necks come into contact with the pollen presenters. The flower heads are also visited by bees and beetles, in particular the Protea Beetle (Tricosthetha fascicularis) but they do not assist in pollination as they don't come into contact with the pollen presenter. Leucospermum conocarpodendron subsp. conocarpodendron is fairly fire-resistant and is known to survive some fires, thanks to its height and thick bark. Plants that have survived a fire develop an umbrella-like shape as their lower branches are burned off and new growth is produced from the surviving upper branches. Nevertheless, this species is not a resprouter and plants often die if burned. Leucospermum conocarpodendron seeds have an elaiosome that attracts ants. The ants carry the seeds away to their nests to consume the elaiosome, but disperse the seeds and keep them safe in the process. This is known as myrmecochory. After a fire, the seeds stored in the ants nests germinate. Seeds of many fynbos species are known to be long lived and are expected to survive for about 80 years in the soil. The Millennium Seed Bank, Kew, have just pushed that figure back quite considerably by germinating some 200 year-old seeds that were collected at the Cape in 1803 by a Dutch merchant, Jan Teerlink. The ship he was on was captured by British privateers, and all documents, including his notebook containing the seeds, were seized. The notebook was kept in the Tower of London and then the National Archives until it was stumbled upon by curators carrying out cataloguing improvements. Three Cape species were successfully germinated: one labelled Protea conocarpa which is an old name for Leucospermum conocarpodendron, another labelled Liparia villosa which is now Liparia laevigata (and also a Peninsula species), and the third an unknown legume. We will have to wait for these plants to flower to confirm Teerlink's identifications. The longevity of the Leucospermum seed is probably due to the fact that the seeds have a layer that is impermeable to oxygen, which prevents germination and slows the ageing process. During flowering season hikers who are lost and without a compass can use the flower heads to navigate by. Flowers on the warmer side of the flower head start opening first, because they receive more direct sunlight. In South Africa the warm side is the north to northeast side. Thus by establishing which side of the flower head has more open flowers gives a good indication of the direction of north, but make sure that the plant you are using as a compass is not shaded on its northern side. This method also works with flowering bushes, where those on the warmer side of the bush will open first. 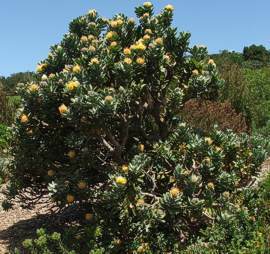 Leucospermum conocarpodendron was much used for firewood in and around Cape Town from the beginning of the settlement at the Cape in 1652 and during the 1700s and 1800s. The bark was much used for tanning and was in great demand, wagonloads of it were sold at the Cape Town market. A decoction of the bark was also successfully used in treating dysentery. The wood was used to make felloes for wagons, and was widely used to make charcoal for smithy work. Plants were cultivated in some places to produce bark and wood. This species makes an attractive garden shrub providing contrast with its grey foliage and flower colour from early spring until midsummer. It is a good cutflower that lasts well in a vase. It is grown for the cutflower trade, although its stems are a bit short and stout for it to make it big in the export market. It has been used to produce very attractive hybrids for the cutflower and nursery trade, e.g. L. conocarpodendron 'hypophyllocarpodendron 'Thomson's Gift' and L. glabrum 'conocarpodendron 'Veldfire'. 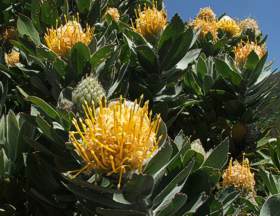 It is also successfully used as the rootstock for grafting of difficult-to-grow proteas such as the marsh rose (Orothamnus zeyheri) and some of the Mimetes. Leucospermum conocarpodendron subsp. conocarpodendron is quite easy to grow as it tolerates heavier, richer soils than many other proteas, but it needs to be well drained. It requires a sunny position with free air circulation, well-drained, acidic soil, and no rich manure or strong fertilizers. Feed with a thick layer of well-rotted compost applied in autumn and in spring. Slow-release or low doses of fertilizer can be used, but avoid fertilizers with a high phosphorous (P) content. This species is a wonderful specimen shrub for large gardens as it usually develops a rounded or interestingly bent shape. It can also used for background planting in a mixed border, and in a rockery. It is also a very useful shrub for a hot, north or west-facing slope. Leucospermum conocarpodendron subsp. conocarpodendron can be propagated by seed or cuttings. Sow seed in late summer to autumn (March-May). Use a well-drained medium e.g. one of two parts coarse sand to one part leaf mould and one part loam. Cover the seeds with coarse, clean sand or milled bark and keep warm and moist. Seeds need alternating cold night and warm day temperatures to initiate germination, 4-10°C to 15-20°C, typical of autumn in the Western Cape. Germination can be induced if the seeds are soaked in a 1% solution of hydrogen peroxide for 24 hours. This oxygenates the seed and softens and loosens the seed coat, which should be rubbed off. Treatment with smoke will also enhance germination. Watering the seed tray with a fungicide will also prevent fungal disease. Germination takes 1 to 2 months and the young seedlings are ready to be potted up as soon as they have developed their first set of true leaves. Take semi-hardwood tip cuttings or heel cuttings from the current season's growth in late summer to autumn (March-May). Treat with rooting hormone and place in a well-drained medium and place under mist with a bottom heat of 24°C. Good air circulation is required to prevent fungal infection. Leucospermums are not particularly prone to pests or diseases. If grown in a position with still, humid air or waterlogged soil they are prone to fungal infection. Strong fertilizer will burn the roots and kill the plant. The usual garden pests such as caterpillars and leaf miners do attack the plants, but can be combated by hand or with a suitable insecticide when an infestation occurs. Daws, M.I., Davies, J., Vaes, E, Van Gelder, R. & Pritchard, H.W. 2007. Two-hundred-year seed survival of Leucospermum and two other species from the Cape Floristic region, South Africa. Seed Science Research 17,2: 73-79. Moll, E.J. 1992. Compass flowers: lost? Consult your nearest Leucospermum. Veld & Flora 78: 57. Rourke, J.P. 1972. 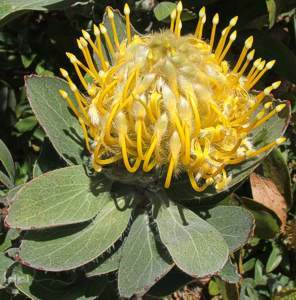 Taxonomic studies on Leucospermum R.Br. Journal of South African Botany, Suppl. vol. 8. Trustees of the National Botanic Gardens of South Africa, Kirstenbosch, Cape Town.